It’s hard not to get carried away now. Nine competitive matches into Steven Gerrard’s Rangers regime and there is increasingly less doubt that this is Our Rangers again. Six successful legs in Europe, and three domestic matches gone, and more and more Gerrard and his men look the real deal. Kilmarnock is one of the toughest away locations to travel to in Scotland – Steve Clarke’s excellent motivational and organisational skills have turned that club around, and the plastic pitch makes visiting teams shift out of their comfort zone. Rangers struggled at Rugby Park last season – even against Lee McCulloch’s Killie. Steven Gerrard’s men looked a class above their hosts and honoured the shirt in the way we expect our men in blue to do. It was certainly the most physical match so far, with plenty of tough tackling and ‘challenges’ thrown in (from both sides) but the difference between Gerrard and his predecessors is this is a Rangers who cannot be bullied any more, a physical and strong team capable of dealing with the rigour of the SPL in the manner of a proper Rangers side, rather than the absolute pansies we’ve suffered the past seven years. 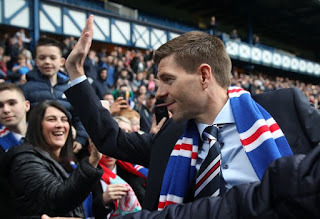 In one appointment and sweeping personnel changes, Rangers seem to have fixed overnight the pathetic regimes which blighted this club, and given us a Walter-esque side right back. From the robust defence (which did suffer a few vulnerabilities today on a surface Connor Goldson and Borna Barisic clearly disliked) to the physical and hard working defence to an attack which is scoring freely and seeing Alfredo Morelos back to his best, this is 100% the kind of Rangers us older Bears are familiar with. Yours truly and everyone on Ibrox Noise and beyond are seeing the Rangers we remember from the good old days – a commanding and strong Rangers team who are striking fear into opponents again. And the level of rise in standard has been staggering – in one appointment Steven Gerrard has converted a soft, feeble and weak Rangers into a big, strong, quick and energetic one. We will run out of superlatives at this rate, but we have to applaud the gamble of this appointment. It was a huge risk but my God it’s working out better than we could ever have dreamed of. The season is young, but this is a title-winning level Rangers again. Where are all those morons who wanted the wee buffalo sold,20 goals plus no danger. I think 20 would be a huge disappointment for him ? Is it just me or did J Jones look like he would damage us every time he had the ball ? Yes it was just you. great win , good to see we can rotate squad and still win comfortable against a team we struggled against last season, really good feel factor this season🇬🇧🇬🇧. on the down side hope Jamie Murphy not to serious and shows again these pitches should not be used in professional football. Don't want to dampen anything, but Morelos apart, our attacking players are not adding goals. We're working on this SWH! There’s a No 10 called Ejaria , it was like playing with 10 men. Send him back..young or not waste of time. Well said Benidorm. I am determined to get carried away. We are going to pump the Tims in a fortnight and go on to piss the League. All good again today ,would agree we goals from other positions, and why don't we just sign lafferty and another centre half this week !! My other concern is still the sports direct issue , when can we start selling the Hummel kit and other merchandise,??? ?we could be making a fortune out of this for more transfers !!!!!! Let's wait till after we play Hibs & Celtic, before declaring we're back to winning ways, 100%. Obviously, i'm loving the wins. Its Coming Home ...To Ibrox! Theres A Blue Future on the Horizon!